Hezbollah, exciting and (not so) new (1982). Come Aboard, Hezbollah’s Americans. We’re expecting you. Let it flow, 72 dark-eyed virgins float back to you. The Hezbollah Love Boat soon will be making another U.S. tax-paid run. 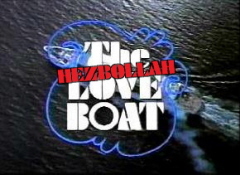 The Hezbollah Love Boat promises jihad for everyone. Your mind on a new (Hezbollah matchmaker service) romance. Hezbollah Love won’t hurt anymore. It’s an open smile on the martyrs’ shore. Among my many writings over the years about Hezbollah, the recent ones illustrate the epitome of Hezbollah supporters’ chutzpah. And the eagerness of America to pander to it. Most recently, I’ve written about whining Lebanese Americans in Lebanon, the majority of whom are Shi’ite Muslim Hezbollah supporters. I’ve also written about Hezbollah’s American agents and slimy federal officials who eagerly service them. Now, something even more outrageous: You–the U.S. taxpayer–are picking up the $3,000 plus cost per person of ships, helicopters, and other transport of terror-supporting, America-hating Americans back to our shores. The cruise ship for which we’re paying is nothing more than the Hezbollah Love Boat, minus the gratuitous bikini shots, cheesy celeb guests, and Gopher. This is unprecedented. All other Americans must pay the U.S. government for such rescue and transport. But not the mostly Muslim, mostly Hezbollah-supporting returnees from Lebanon. It’s a double standard, discrimination, and most of all, a violation of the Constitutional clause that requires Congress to establish no national religion. Pursuant to this clause, the U.S. government can’t prefer or favor a religion either. But it is doing exactly that by waiving the $3,000-plus fee to Arab, mostly-Muslim Americans. Congress passed a law requiring payment for such transport. So why is our government waiving it only for a group of people consisting of mostly one ethnic, religious group? In response to the evacuation of people from Lebanon, did the use of a cruise ship ring any bells? During Katrina, DHS used old cruise ships to house people. The use of cruise ships were done without any competitive bidding (ostensibly to save time) and the companies providing the ships charged a premium to house people ($300/day from what I read). A great deal for the cruise line as the ships were too old to be put in service. Later, DHS, again, came up with the great idea to house aliens of these cruise ships, and of course, the cruise lines were only too happy to have their ships used; again, non-competitive contracts. I think the idea was dashed by Congress. And when the Lebanon situation occurred, again, the use of cruise ships again reappeared. I bet the government is paying quite a premium for that cruise ship. Don’t we have a navy that could evacuate those people? From where did the cruise ship contract emanate? He raises good questions. We’ll look into them. Meanwhile, the Hezbollah Love Boat cruises on. YOUR TAX DOLLARS AT WORK! Don’t you just love the duplicity of these America-hating, 7th century, Muzlum, devil-worshipping scumbags? Here we have a bunch of brain-dead Muzlums, who hate the U.S. and Western civilization, who support Islamic terrorists around the world, who are living in terrorist-loving Lebanon – then, when the very savages they support start a war with Israel, they immediately want the U.S. taxpayers to come to their rescue. And, where do these barbarians flee to? Iran, Syria, Iraq, Saudi Arabia, The UAE, Egypt, Malaysia, Turkey, Pakistan? NOPE! Hell no! They flee into the comfort and safety of Uncle Sam’s arms. Typical Muzlum degenerate cowards – whenever their asses are in a sling, they retreat. What vile, evil Neanderthals these Muzlum swine are. Thanks for the laugh. Also for the hints on accreditating material. Learn something every day. The parody is fun. The reality is not so welcome. We could have done what the British did in leaving a Hezbollah sympathizer cleric, Omar Bakri Mohammed behind. At least they know better than to allow someone into their country who supports terrorism against Jews and Westerners. Like we so get it. This Hezbollah Love Boat spectacle, paid for with American taxpayer dollars, is one fiasco that didn’t need to happen.